Werner Fire Escape Ladders - Industrial Ladder & Supply Co., Inc. 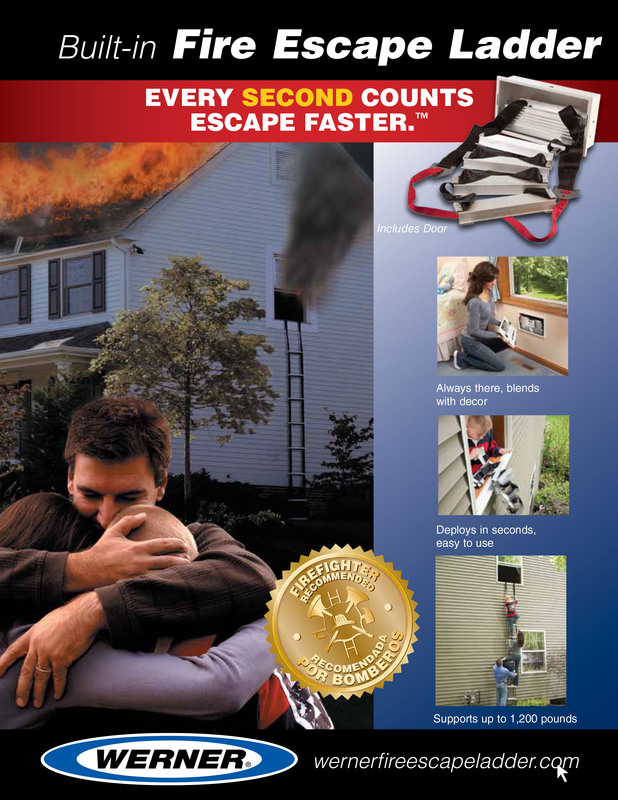 The ESC 220 is a 2-story built-in fire escape ladder that installs permanently under a window making it always there if ever needed. Deploys in seconds for a quick escape. Supports up to 1200 pounds and is easy to use. The rungs are anti-slip and have standoffs for ease in descending. The climbing assist strap aids in exiting the window. EVERY SECOND COUNTS, ESCAPE FASTER. The ESC330 is a 3-story built-in fire escape ladder that installs permanently under a window making it always available if ever needed. Deploys in seconds for a quick escape. Supports up to 1200 pounds and is easy to use. The rungs are anti-slip and have standoffs for ease in descending. The climbing assist strap aids in exiting the window. EVERY SECOND COUNTS, ESCAPE FASTER. Strongest solution on the market supports up to 1,200 pounds allowing for more than one person to escape at the same time. It can also support a firefighter in full gear to perform rescues. Werner Fire Escape Ladder is child friendly with anti-slip rungs and standoffs so that little fingers can easily grasp each step and is light enough for a child to use in an emergency. Long enough to accommodate a three-story home with a total length of 23ft-8in, or order the two story model at 15ft-10in, extra rungs should be removed during the installation process. Can be painted or wallpapered to blend with any room decor or home style. Installing the provided insulation sheet behind the unit meets all Energy Star requirements. Werner Fire Escape Ladder attaches securely to studs positioned 16 inch on-center beneath the window. No need for special construction. You can utilize professional installation. However, Werner Fire Escape Ladder can be installed by a handy homeowner. Emergency ladder repacks easily encouraging fire escape drills. Firefighter Recommended - Firefighters from all over the nation have high regard for this innovative life-saving product; including emergency workers who have witnessed deadly tragedy first hand.